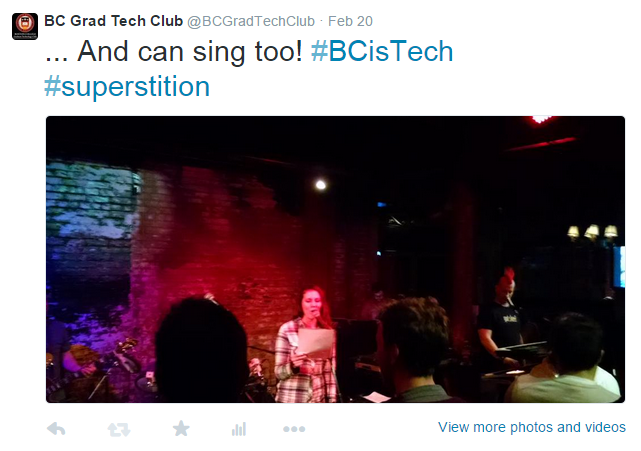 Read about all the cool things the BC Grad Tech Club is doing! Former President David LoVerme (MBA ’15) logs part 3 of his MBA reflections. Wow, what an amazing response so far…glad everyone is enjoying my MBA recollections (it’s a lot of fun for me too). If you missed it, you can find parts one and two here. Now onto Part 3! MBA courses are, by nature, often discussion based. While I generally like this format, at times it can be unclear whether we are really on the right track or just blowing smoke. With Professor Mary Tripsas at the helm, this was never the case. She had no problem calling out vague or unsupported comments and really forced us to elevate our game and exploration of the topic at hand. This challenge was energizing and is what really made the class stand out. Other than Tripsas leaving a normally quick witted classmate speechless after calling him out for yawning in class, what do I still remember? Our former Club President logs part 2 of his MBA reflections. With my Canadian vacation behind me, it’s time for Part 2 of my 6 part “Condensed MBA” series. (Click here if you missed Part 1) Read on to hear about first semester, quarter 2. Like Accounting, the biggest challenge for me was my general lack of familiarity with the vocabulary. Getting used to a definition of “coupon” that didn’t include cutting something out of a circular was a bit of an adjustment but having Bob Taggart at the helm meant I had an understanding professor who was always available and ready to help. So what stuck? 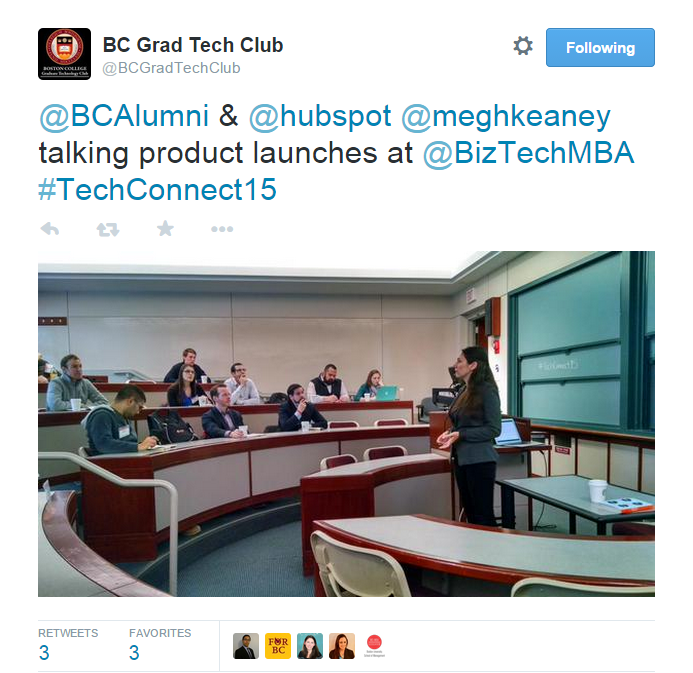 Former club president, David LoVerme, shares his thoughts on the first leg of the BC MBA. Anyway you slice it, a full time MBA is intense. You read hundreds of cases and articles, write thousands of words, take hours of exams, and it’s all over in a flash. Now that I am officially a Master of Business Administration, I thought it would be worth reflecting on the single biggest take-aways from each class I took. My MBA lasted two years, the first of which uses quarters and the second, semesters. As a result this will be a six part series of posts. With maestros Pete and Carolyn Wilson at the helm, this class was certainly one of the most memorable of my time at BC. Besides the lowest grade of my MBA career, however, what did I take away from the class? 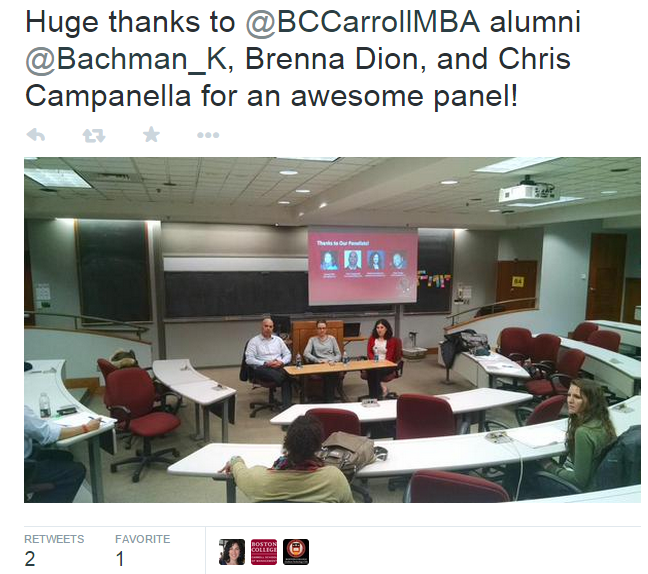 Recently, we welcomed back MBA Alumni Chris Campanella, Brenna Dion, and Kimberlee Bachman for our Spring Careers in Tech Panel. Representing three different functions and three different company cultures, they were able to lend a lot of wisdom to help guide current students toward the career that is right for them. Chris, Program Operations Director at Boston Scientific, talked about how he started as a project manager and now leads a lot of large projects, often related to supply chain and technology adoption. Initially an engineer, then a consultant, Chris came back to business school because he wanted to get into finance but his internship made him realize it wasn’t for him. He chose Boston Scientific because being in the healthcare industry allows him to have a significant impact on people’s lives and the company has continued to offer him new challenges and opportunities to develop. Chris urged us to put our emphasis on having a general direction as opposed to a specific plan to make sure we were open to the opportunities that present themselves around us. Brenna, Community Operations Manager at Uber, spends her days wrestling with the question of how to scale the business. Managing service support for the East Coast she is constantly working on ways to make the support system more effective. A JD/MBA, Brenna realized that her passion was more for business than for law and she liked operations because of the emphasis on how to do things better. She has always liked the tech industry but wanted a physical component as well. The fact that Uber is powered by great tech but is also moving real people and things is one of the main reasons she was attracted to the opportunity. Kimberlee, Senior Product Marketing Manager at RSA, spends most of her time thinking about identity and access management and how to tell the product story. She spends her time pricing, crafting messaging for sales to use, going to and organizing conferences, and meeting with customers. An alum of TechTrek West, Kimberlee was inspired by the trip and set her sights on a marketing role in the Tech Industry. The cross-functional nature of her role and the strong BC presence at RSA made the job and the company a great fit. While the three have vastly different roles, there are a few key skills that they each identified as critical. Problem Solving, Communication, Adaptability, Relationship Building, and the ability to stay calm. Brenna mentioned the challenges of managing and incentivizing remote employees and the need to be constantly seeking new and innovative solutions. Kimberlee seconded problem solving as a skill, talking about the need to develop meaningful frameworks and referring lovingly to her MBA as a degree in decision making. Kimberlee also emphasize the importance of good communication and delivering information in the way that people want to receive it. She credited Bob Radin’s class and the DISC training as having had a major impact on her ability to communicate effectively. Brenna was in agreement, adding the importance of anticipating people’s questions or issues and addressing them before they are asked. No surprise in the Tech Industry, all three talked about the need to be adaptable and take a positive attitude towards change. Chris mentioned that Boston Scientific, like most companies, is moving to be more agile and people who can embrace this are the ones that will be most successful. The three also rallied strongly around the idea of relationship building and earning influence. Kimberlee and Chris both talked about the importance of grabbing lunch or coffee early and often, when you do not need anything so that you can develop strong ties and influence that will allow you to be effective within the company. They also pointed out that you should keep networking outside of your company as well to stay abreast and relevant in your industry. Finally, Brenna emphasized the importance of being able to stay calm. She likened Uber employees to ducks on a pond, from the surface everyone appears calm but its totally nuts underwater. Keeping calms helps in being able to maneuver through ambiguity to find a good path forward. While they may have agreed on skills, the culture at the three companies is very different. Kimberlee shared that RSA has an interesting culture because it is a smaller, division in a big company (EMC). It is fast-moving but also has some of the perks, advantages, and occasional drawbacks of a large enterprise. Collaborative in nature, the company is full of BC people who seem to thrive in that environment. In contrast, still a new company and experiencing rocket ship growth, in many ways Brenna says that Uber is still creating its culture. Quadrupling in size in the last year, the culture is a hodgepodge of the different experiences of its employees. On thing that has been constant, however, is the creed that the CEO reminds employees of every few months, “You need to step on toes to be successful at Uber.” Every decision is data-driven and the best idea wins. The company is full of extremely passionate and devoted people who live and breathe Uber, often working long hours to address the constantly changing needs. “You probably won’t be the only person in the office at 9pm,” Brenna offered, “…or midnight. I can see the light though, because everything I am doing is to make my job easier.” Unlike Uber, Chris told us that you probably won’t be working until 9pm at Boston Scientific. A bigger company with a strong emphasis on quality, decisions take longer and tend to get more siloed. The company is not the right fit for people who want quick, reactive decisions, but it does offer a great work-life balance and lots of opportunities backed by great resources. It is a culture that has changed a lot as the management changes, Chris alone has seen four CEOs, and he encouraged us to remember that big changes in management, funding, IPOs, etc. change a company’s culture so we should look at where a company is in its life cycle and try to anticipate what might change. All three panelists have different responsibilities, company cultures, and career paths, but one thing they share is an appreciation for their BC MBAs. Each credited their time in the Heights for helping prepare them for their current success. So what was the single most valuable thing each took away from their time here? For Chris it was the Team Projects and the Business Plan competition that taught him to work effectively with peers and separated him from coworkers with prestigious MBAs from other schools. For Brenna, it was the people and friends “by far” as well as the opportunity to test and confirm her skill set and find the right fit. Finally, for Kimberlee it was the BC Network, the relationships she made both with her classmates, and with alumni that helped her find a job and have continued to be a resource for mentorship, engagement, and even giving back. A huge thanks to Chris, Brenna, and Kimberlee for sharing their insights with our club and continuing the longstanding BC tradition of giving back! 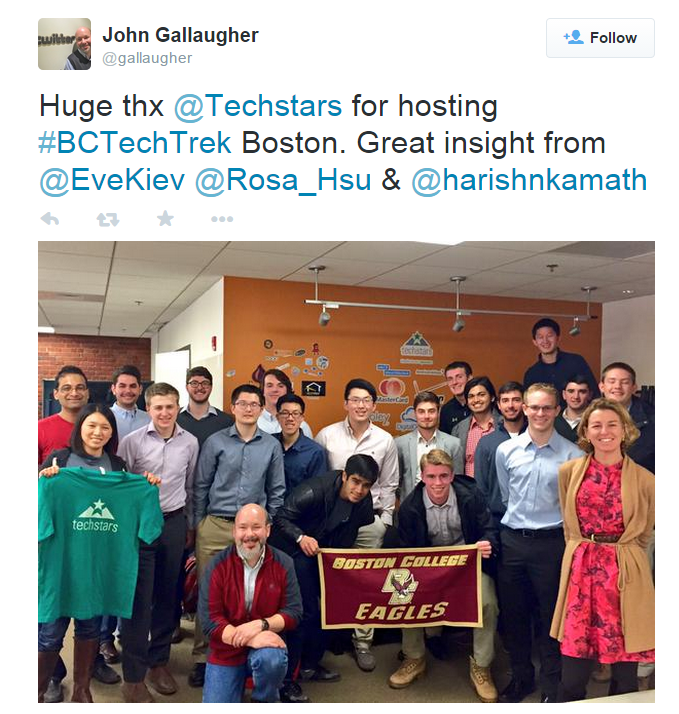 Last Friday, members of the Grad Tech Club joined forces with our undergrad counterparts to visit TechStars Boston in their headquarters downtown. The visit was a great experience where we learned a lot about one of the most prestigious accelerators out there. Like most accelerators, TechStars provides space, resources, and mentorship for the 1% of applicants it accepts as well as some upfront capital and the promise of more in a convertible note should the company get funded later on. More than just great companies, however, Techstars is committed to producing great ecosystems. One way they do this, which I found to be particularly interesting, is by bringing on not only startups but also coders and young business professionals as Hackstars and Associates. These people serve as floaters so to speak, and resources available to the different Techstars companies. This gives an on demand labor force for the companies and the opportunity to plug in to the Techstars ecosystem for the Hackstars and Associates. Team first–Since most companies have some kind of pivot it is important to invest in good teams. If you invest in an idea and then the idea changes…what did you really choose? The real highlight of the visit, however, came by happy accident. One of our group asked a question about hardware startups. As we were sitting in the open, various people had been shuffling by all afternoon and at that moment, our host stopped the gentleman walking by and asked if he had a moment to answer a question about hardware startup. The guy turned out to be Harish Kamath, cofounder of Headtalk the makers of Magnet. In the next 5-10 minutes Harish managed to give us a succinct and anecdotal summation of the real value of doing Techstars. His product, Magnet, is a bracelet with a pair, designed for long distance significant others. When you tap your bracelet, it lights up and vibrates its counterpart to let your significant other know you are thinking of them, regardless of the distance that separates you, helping people stay connected. Although they had a crude prototype, Harish and his co-founder are engineers not designers but one of the mentors Techstars paired them with was the design firm IDEO. With the help of this mentor, they learned to understand their users better and develop form factors that really met their users needs and preferences. The next task however, was to produce multiple prototypes for testing and time was in high demand. Founders juggle a million and one tasks at a time, as Harish put it, “they don’t call it an accelerator for nothing!” and therefore assembling the prototypes was a task that was hard to find time for. Once again, Techstars could help! Techstars has a 3d printer and one of the Hackstars had an interest in hardware and was happy to help, assembling dozens of prototypes so that Harish could focus on other aspects of the business. Finally, there is the value innate in being part of a cohort. The Magnet team decided to do a Kickstarter campaign and needed to create internet buzz about their product. Once again, however, these guys are engineers and not web marketing experts. It turns out, however, that fellow Techstars cohort members Fortified Bicycle had already successfully executed two Kickstarter campaigns and social marketing was literally Mavrck‘s product! This gave Harish and his team the resources and advise they needed to tackle the digital world, even with a hardware product. We could not have had a better case study in the value Techstars brings and the reason for doing an accelerator. 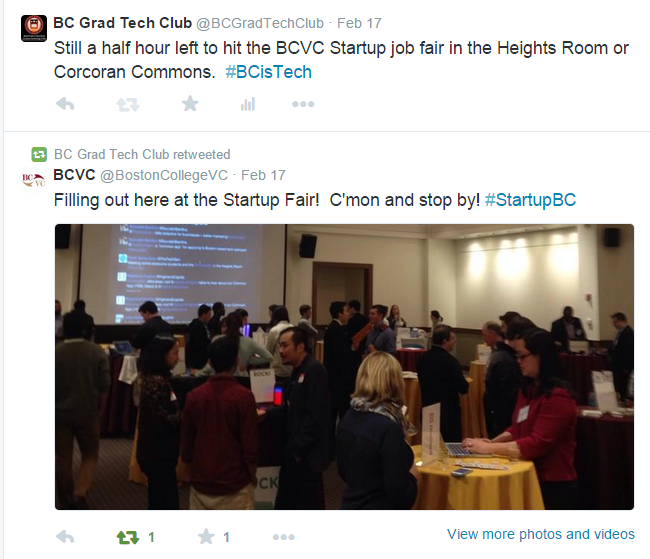 BC already has some strong ties to Techstars through previous hackstars and associates and we look forward to an MBA startup slingshotting out of the program sometime soon!